Mother’s Day is just around the corner, and with our hectic modern-day lives, we more often than not just send her a card in the mail and then continue on with our busy schedules. Take a little time this year to make her something beautiful and sweet to eat. This twist on the classic strawberry shortcake is so quick and easy, making it won’t impede on your busy life. You can even prepare this up to a day before serving. See? You can have your cake and eat it too. 1. Prepare the strawberries. Wash and pat dry with a towel. Core and slice half of the strawberries into thin slices lengthwise (about 1/8 inch thickness). Cut the rest of the strawberries in half lengthwise. 2. Make the whipped cream. In a large bowl, beat the heavy whipping cream until soft peaks just start to form. Add in the powdered sugar and vanilla extract; continue beating until stiff peaks form. Do not over-beat. 3. Assemble the cake. Using the whipped cream as a “glue,” spread the bottoms of six ladyfingers with a dollop of cream each and arrange them, sides adjacent, onto the serving platter. Spread 1/3 of the whipped cream over this bottom layer of ladyfingers, then evenly place a layer of the thinly sliced strawberries over the cream. 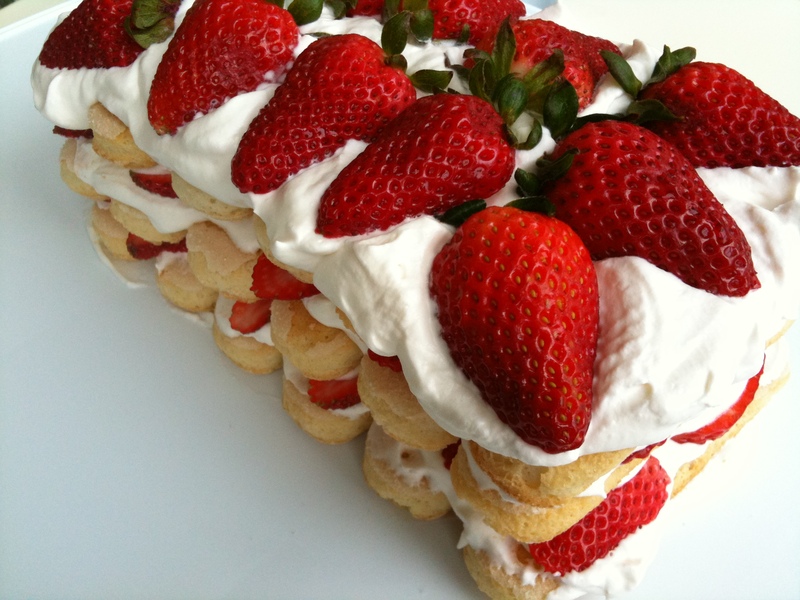 Build a second layer by “gluing” six more ladyfingers down, topped with another layer of cream and strawberries. Place the rest of the ladyfingers and cream to make the top layer, and finish off using the halved strawberries. * Prepare several hours before serving: ladyfingers will absorb moisture from the cream and have a lighter texture. Can’t wait that long? Quickly dip the bottom of each ladyfinger into some milk as you build the cake. * Be careful not to over-beat the whipped cream. Otherwise, it will become lumpy and stiff. * Feel free to double (or triple!) this recipe. Since ladyfingers are being used as the cake, you can build it as tall, wide, or high as you like!